The Lord prompted me to select 10 verses and issue a journaling challenge to ask Jesus to answer questions about these common verses. I will share only a small segment of what people sent me as a result of this challenge. Please feel free to ask Jesus these same questions and reply to this post with what Jesus said to you too! Jesus’ comments will be in italics, as usual. Jesus, show me a glimpse or a picture of the glory of God. 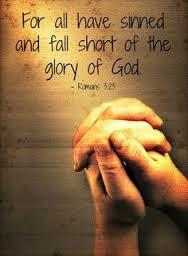 What is your heart for me, even though I fall short of Your glory? The LORD showed me the power of God making the heavens and the earth; the warmth of the sun; the love of a warm embrace; and His gentle thumb brushing away a tear. God’s glory is power, love, hope, and holiness. It’s perfection of His Presence. The experience was physical, emotional, mental and spiritual. God’s glory is His “is-ness” It’s His identity. Perfect, yet not describable enough to put into a box. Jesus, what is your heart for me, even though I fall short of Your glory? The Lord immediately gave me the Song Priceless by for King and Country…. Lyrics below. I would say that does a great job of answering the question! Thanks LORD. Thank you so much Lord for this wonderful truth! My Father’s glory is more beautiful and radiant than the most incredible sunrise with every color on the spectrum. His resplendent beauty is so magnetic you would not be able to look away. Each time you witness what you consider a beautiful sunrise, sunset, or evening sky, Charisse, it is only a glimpse of His radiant glory. This is why you find it difficult to turn away from the magnificence of this beauty. It draws you near because His creation is a reflection of who He is and it draws you in. Beloved, everyone falls short of My glory. There is no perfection on this side of heaven. My work on the Cross reveals My heart for you. Your imperfections would never alter My love for you. Remember that I knew you before you were conceived and I knew you would be exactly who you are and My plan was always to be your Savior. Never forget or doubt My love for you. Lord Jesus, reveal and fill my heart with your glory. Lord, show me how to bask in your glory so sin will not grieve me! I paid the penalty of sin fully on the cross for all mankind. When you confessed your sins, you became a new creature, old things passed away and all things became new. However, you have not always walked in that newness of life. When you have fellowship with Me in the Spirit, then I begin to reveal to you things I have not revealed to you before. When you walk in darkness or enjoy the fruits of unrighteousness, My glory cannot fill you. You need to be a pure and clean vessel always for My glory to abide in you. Present yourself daily to Me at the altar of sacrifice and renew your mind with My word. Pray in your closet and ask for more infilling of the Holy Spirit. Fill your heart with visions and the glories of heaven. Look in your heart at pictures of Me. See Me living and doing the works I did in my earthly ministry. Stay in the presence of the Father, Son and the Holy Spirit, then you begin to have clearer picture of My glory. Dear Jesus, my Lord and Savior, how do I live in order to enjoy Your Glory. Ans: My Glory fills the earth & heaven. I am in no doubt that you are already a partaker of My Glory so just be yourself and trust in Me, do not doubt at all. The Lord of glory is your Shepherd and Shield. Take joy in this. I love you dearly.